Here’s a new music video from David Choi, which was shot for fun in one day with Jude Weng from Brand New Entertainment. Jude is the exectutive producer for shows like Rock the Reception, Scott Baio is 46 and Pregnant, and Secret Lives of Women. Could a David Choi reality show be in the works? His YouTube channel already has almost 4.5 million views and a recent remake of I Gotta Feeling by the Black Eyed Peas got mentions by Ashton Kutcher and Ryan Seacrest. Also check out David Choi’s first official music video “Won’t Even Start” by Wong Fu Productions. This entry was posted in music on August 31, 2009 by Kevin Hsieh - channel APA. If you’re a Sims 3 player, you’ll love this feature. 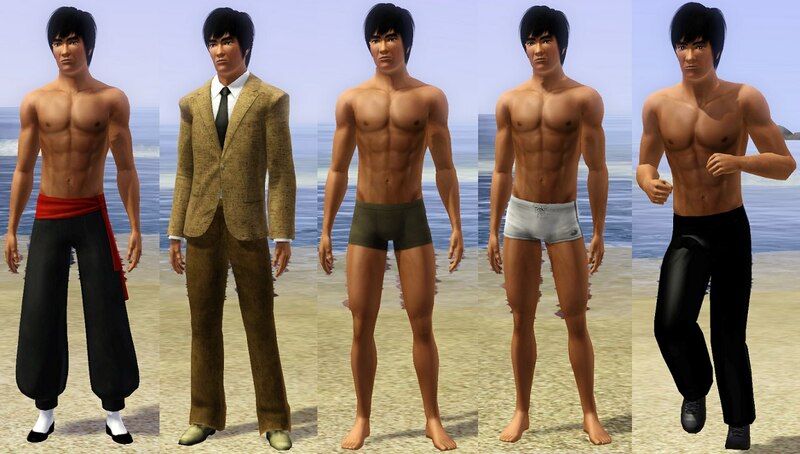 We found a site that shows you how to add a Bruce Lee Sim to your game here. The Sims universe will never be the same. Bruce Lee did change the world after all. Now if only they could get Bruce Lee animated like the clip below. This entry was posted in animation, videogames on August 31, 2009 by Kevin Hsieh - channel APA. Great footage of Quest Crew‘s performance over the weekend at Music Speaks. Watch their routine. You’ll recognize some of the moves from the Dance Link Michael Jackson music video and America’s Best Dance Crew along with some new moves. Just when you think the routine ends, there’s more. Also if like the tutting part of the routine, check out Hok’s appearance in Office Life. This entry was posted in dance on August 31, 2009 by Kevin Hsieh - channel APA. By now, you’ve heard that Kato will be played by Taiwanese singer Jay Chou in the upcoming films “The Green Hornet.” We found out that model/actor Robert Ryu will be Jay Chou’s stand-in and photo double for the film. Keep your eyes on this rising star. Robert is the talk of many agencies not only in the US but also in Korea and Japan. Check out his demo reel. Hope to see more Robert Ryu on camera in the future. You can learn more about him here. This entry was posted in movies on August 31, 2009 by Kevin Hsieh - channel APA. R&B group IBU was featured on The Filipino Channel’s “Balitang America.” The group recently delayed their upcoming album “Inspired By U“. Now we know why. The Chicago based group got signed to Koch Records. The new release date of their sophomore album is November 10, 2009. Look for tour and promotional info coming soon. We found a trailer for the 16 minute short “Evolution” directed by Kenji Lui & Vivian Po. Here’s a synopsis of Evolution. Lois is forced to play a game of life and death with no instruction. She doesn’t know she has become the prey of a monster, or is it the other way around? Look for it at a film festival near you including the 2009 Philadelphia Asian American Film Festival . This entry was posted in shorts on August 30, 2009 by Kevin Hsieh - channel APA.